Obituary – Smith, Virginia Lee Quance « Perry High School Alumni Association, Inc.
Virginia Lee (Quance) Smith, daughter of Ray and Marie Quance, was born on September 25, 1931 in Pampa, TX. She was received into the Kingdom of God thru Baptism in 1939 at the First Baptist Church of Pampa, TX. She was 83. 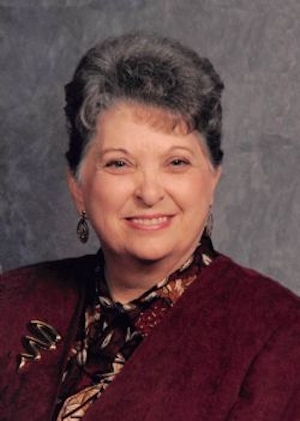 She attended school in Pampa and High school in Perry, class of 49. She was married to the late Buck Smith on October 29, 1948 in Perry, OK. They farmed for many years southwest of town on the Knori home place. She was a member of the Orlando Christian church for many years. Her love was family and cooking. Survivors include daughter Iva Lee Washington and husband, Mark Washington of Orlando; four grandchildren: Scott Washington of El Reno, OK, Amanda Smith of Mt. Juliet, TN, Jason and Aaron Smith of Nashville, TN; one great granddaughter: Allison Washington; brother Leroy and wife Marie Quance of Nardin, OK and many nieces, nephews and cousins. She was preceded by her husband, one son Terry Dean, her parents, and sister JoEllen Gile. The funeral service will be at 2 pm on Thursday August 27, 2015 at Orlando Christian Church with Rev. Bill Smith officiating. Burial will follow at Grace Hill Cemetery Pavilion. The care of the family is under the direction of Brown-Dugger Funeral Home. Online condolences may be made at www.brown-duggerfuneralhome.com. In lieu of flowers, memorial contributions may be made to the donor’s choice or The Orlando Christian Church care of Brown-Dugger Funeral Home 1010 N. 7th St. Perry, OK 73077.